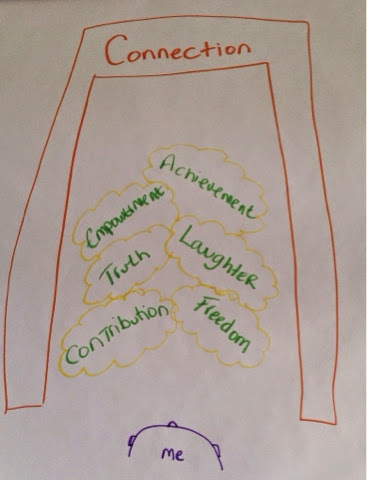 Yesterday I demonstrated how you can determine what the values that are motivating your actions are in any given context. The premise being if you can understand your motivators you might be able to work out why you're not taking the necessary action to achieve a specific goal (this week's theme for my blogs). The challenge with values is they're powerful things, and just knowing that a certain value is hindering you isn't in itself always enough to stop it. I remember having a huge insight the first time I did this about why my value of Freedom was holding me back. It was as if at any point in time I had 360 degrees of freedom and making a choice would reduce that to 1 degree - so why would I make any decisions. Once I realised this, whilst walking it out in a local park, I realised that I could change my representation so that with every decision I had a whole new 360 degrees worth of freedom :-). Therefore ensuring my value was met and decisions could be made. It's simply a case of exploring the meaning of a value - what does having it look like to you, what might it be stopping you doing etc. 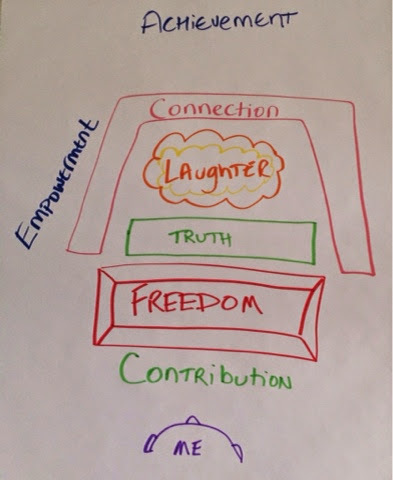 Using my hierarchy, this process is about linking the goal I want to achieve to the values of freedom and truth. Not an easy list to do this with, which is why I needed to try what I'll demonstrate later, but not impossible. So let's think of things I'm currently procrastinating on - oh yes - writing my book. 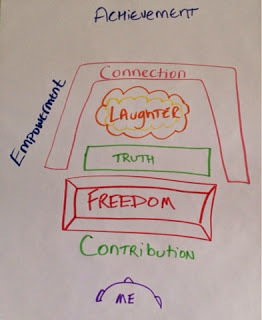 Currently I can see how writing it provides the last 3 values (connection, contribution, achievement) but can also understand why freedom might be getting in the way. After all once the book is written, its then published (and a publisher has already said they're interested), and then in my head freedom goes out the window. I mean people will want me to go here and there, and be at their beck and call. Perhaps not as bad as I've made it seem but you get the idea . How might your higher values be what's stopping you moving towards a goal. The key therefore is finding ways of understanding how achieving the goal will also meet the value. To provide the motivation needed by saying in my example not only will my freedom not be hindered but it will be enhanced. So a successfully written and published book will provide more interest in what I do, more opportunities and therefore more freedom to choose what I do. 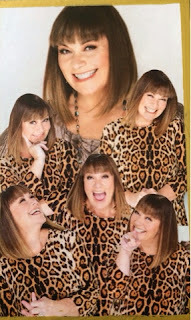 Interest in the book will lead to more speaking and training opportunities and therefore certainly more opportunity for truth and laughter too. The aim would be to keep going until you can sense the motivation to take the necessary actions has increased. Might this be the answer to why you're not achieving your goal? It can be as simple as just reprioritising your list! Not so easy though. One way of doing this would be to write the values on separate pieces of paper and put them in order you've discovered from yesterday's exercise. Now identify the order you think would be more helpful and as you move the words into that new order (one at a time) notice what comes up for you - emotions, feelings, thoughts, beliefs, memories etc. I'd then suggest it's a case of making a note of what comes up, putting the values back in the original order and then taking time to explore what came up. 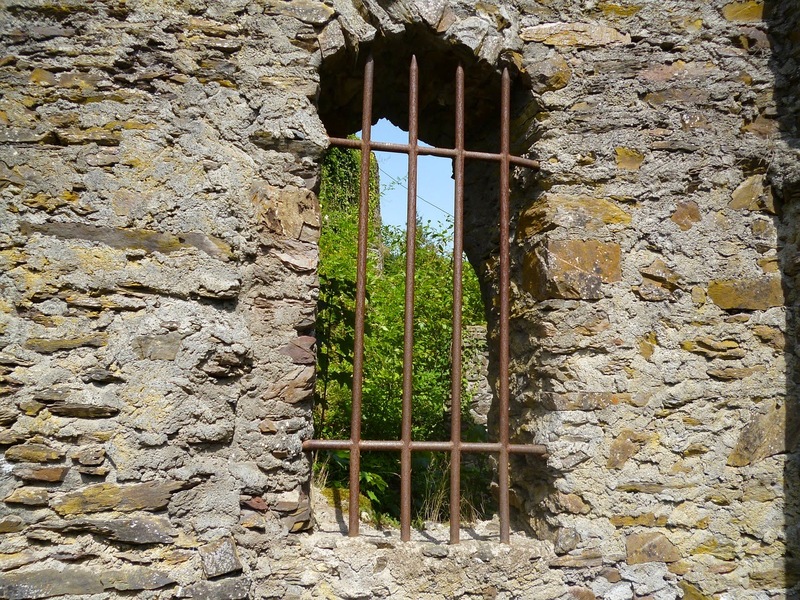 We're covering 'beliefs' in the blog next week, but for example a belief from childhood that everything in life is scarce might mean you have security as a top value. If you were able to alter the belief about scarcity the value's importance might diminish. There is no right or wrong - just what is, and an understanding of how that supports or hinders you in your daily life. Armed with this information you can then make choices about changes you might what to make. There are a number of other processes that help you do this that it would be very difficult to share here. The key is not forcing a value to be anything than where it is in the hierarchy. By understanding why its as important as it is, however, you might be able to change its importance. Pick one of your values. As you imagine the value can you see a word, and is it in colour or black and white, or is it a picture, or perhaps a sound or feeling. Once you've got a sense of that then explore it some more - is it large or small, where it is located spatially (inside or outside of you), what happens when you turn it up or down and so on. Just have a play and notice what you notice. Now do the same for another value and notice the differences. Once you've done this for a number of your values then if one really stands out as different what happens if you make it more like the others? or what happens if you make your first value more like your last value or visa versa? Just have a play, calibrating all the time the impact it has. Perhaps even think about the goal you've been having problems achieving and notice if any of the changes you make it feel more achievable. 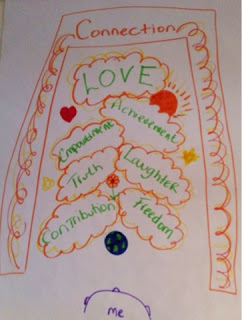 When I drew my list of values for work on a flip chart here's what I discovered. It seems Contribution might have become more important just as I've been writing these blogs :-) which links to an observation I made when writing about the Well Formed Outcome on Tuesday. Looking at this visual representation of my values hierarchy it feels like achievement is a little left out, and freedom still might be a little too big for its boots. It feels less onerous than the original - I may want to add a colour to the yellow bubbles and find something to put into the gap at the top (as I've been tidying the blog up I've come up with an idea - see below). Only time will tell if doing this helps or hinders me getting better results moving forward (but hey I did just use the word results - so perhaps achievement is now more in the fold). Whilst this all makes sense to me and feels right - remember - values are driven from the heart so the brain will have a hard time if it tries to make sense of it. Especially if you try to make sense of someone elses representation of their values. It doesn't mean someone can't ask questions we just have to make sure we don't make assumptions about what size, distance etc means, or try to apply our meaning to a word. As ever if you try it for yourself you'll get a sense of whether this particular process might be able to unlock the reason for you not moving towards that goal. Sorry to go on and on - I just love exploring values and applying all the NLP techniques to them. Just don't get me onto Landscaping Your Life otherwise we'll be here all day! Do let me know if you have any queries and don't forget coaching sessions are available if you'd like me to take you through the process and explore your values more to understand the impact they might be having on your life alison@thepurchasingcoach.co.uk +44(0) 7770 538159. Inspiring change inside and out when what you're doing isn't working. * Other blogs covering goals this week have included: Goals are not sweeping generalisations, Well Formed Outcomes, what's stopping you and what's motivating your actions. You may also find of interest my blog from the archives on ethical behaviour and the impact of our values on whether it's even possible. 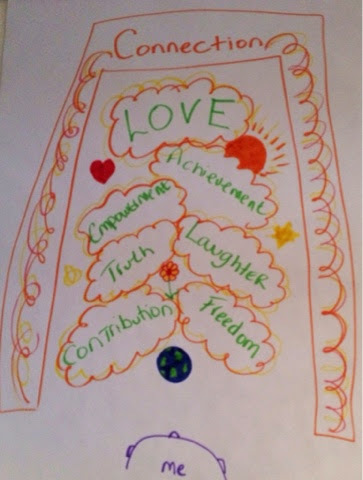 PS I did say values aren't heady things but come from the heart - here's what happened as I was writing this blog. 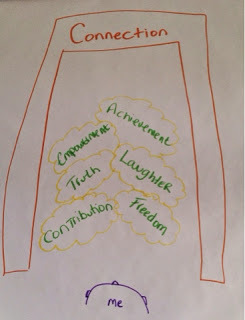 As I looked at the new visual representation of my values (above) and thought about what to add to that space below connection Love popped into my head and I smiled. My original list of 10 values included Love, and for the purposes of not scaring people off (sorry I know I should know better) decided to omit it when I reduced the list to 7. Which just shows how unconscious but important values are as I unconsciously, it would seem, left room for Love - knowing it would eventually get added back in :-). A great example of not judging our values - they are what they are and it's about working with that to do what we need/want to do every day. I have a session with my coach today so think I'm going to ask that we explore this further. Although goal setting more generally will also be discussed - they do say we teach what we most need to learn or in this case - need to Do. As we've seen in other blogs * this week motivation is key to achieving our goals. The challenge with what motivates us is it's unconscious - ie we know consciously something motivates us (our values) but we're not aware of what they are specifically. Never the less they still provide the motivation to act or not act in everything we do every hour of every day. Because values come from the heart not head, and as the language of the heart is very different from the head, values are generally unconscious - no tick lists for determining your values I'm afraid (I know many do use a tick list but aspirations rather than reality have a way of finding themselves on those lists). Not aspirational values like making a difference or world peace - not necessarily anyway. Do you know the actual values that drive your behaviour - ie that determine whether you get out of bed or not, or do this task instead of that task, or prioritise that instead of this etc. And in the context of the blogs this week do you understand which values might be stopping you from achieving your goal(s)? Keep asking yourself the question "what important about" your last answer until you get something like "I don't know - it just is" ie you keep going till you can't give another answer. Then think of another activity at work and follow the same process again. In this instance when asked "what's important about sharing learning" I could have gone a couple of ways - one looking at what was important about learning and the other looking at what was important about sharing. So I could do it again using the other aspect. Now you'll have 2 values. The aim is to do this until you have 7 or 8 values. You may find the same word crops up frequently but just keep going with different aspects of your work. Another way of eliciting values is to chunk up and just ask "what's important about my job" and notice what you notice- or previous jobs you've had - or jobs you would like to have. Steve Clarke reminded me this week of another means of determining your values. That's to think about the things that annoy you most about other people ie what behaviour that other people do makes you the most angry (e.g that you think someone should be sacked for) and then ask the above set of questions about that behaviour ie what's important about not doing that behaviour. For example people being late might make you very angry, which might mean timeliness is important and that might be a value in its own right, or the value generating the anger might be more about respect. 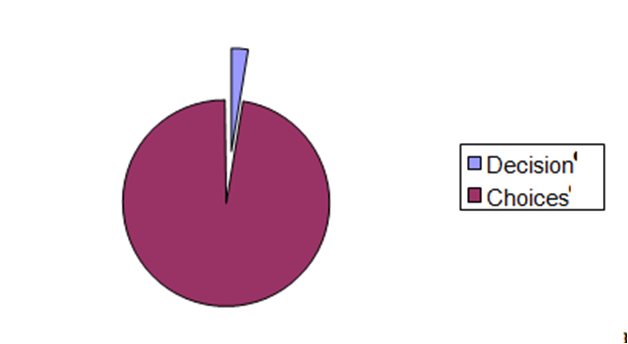 That's why its important to keep asking "and what's important about that?" until you get a the same answer". Another suggestion from Vince Favilla (added a number of weeks after post publication) is to consider what you like being complimented about and then asking "what's important about that". You could also take that to the next level and consider attributes you compliment others about and consider "what's important about that?" too. 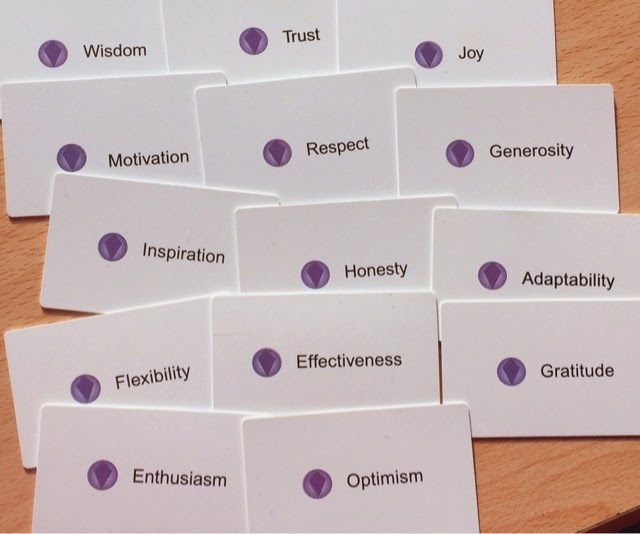 The aim is to find out what motivates you and certainly annoyance, anger or their opposite or any hightened emotion are great ways of connecting with your values. Remember you're aiming for a list of 7 or 8. Once you've got your list of values you need to determine their hierarchy. You do this by comparing each value with the others and saying which is most important. For example - take my list of values of Achievement, Truth, Connection, Contribution, Freedom, Laughter, Empowerment. Which then enables you to consider how this hierarchy might be negatively impacting you achieving certain goals. Certainly freedom was getting in the way of me making lots of decisions as you will discover in tomorrow's blog. Truth can certainly get me into more trouble in a work context than someone who doesn't have it in their hierarchy - please note just because it's not in the hierarchy doesn't mean it's not something you do - just not something that is as important as those values that are on your list. If you're shouting "Truth is important" but it hasn't turned up on your list then it might be that what you're doing at work doesn't fully meet all your 'work' values (ie we only used the activities that you are currently doing). In which case you may want to have a go at answering"what's important about the things I want to do at work but aren't currently". Then place them in the hierarchy you already have and notice what you notice. You might also want to explore any obvious conflicts between values too. More tomorrow on how to resolve clashes or unhelpful values hierarchies. Have a go yourself - let me know if you have any queries. * Other blogs covering goals this week have included: Goals are not sweeping generalisations, Well Formed Outcomes, what's stopping you and Goal or Gaol. A related blog here on why I think 'business values' is a misnomer. As I've blogged about goals* this week autocorrect seems to have spent a lot of time changing gaol to goal. It had me thinking though about whether goals/gaols are actually related. A great reminder to refresh and revisit goals on a frequent basis, and perhaps also provide incentives when you meet certain milestones. These similarities also remind me of my "can we be faithless and therefore trustworthy" blog. * Other blogs covering goals this week have included: Goals are not sweeping generalisations, Well Formed Outcomes and what's stopping you. Tomorrow we look at values and how they provide the motivation to move towards achieving our goals, or not as the case might be. So here's the thing - you've stated your SMART goal and used the well formed outcome process, you understand why its important, you often feel the pain of not having achieved it, you've identified incentives for milestones along the way but you're still not motivated to move towards your goal. So what might be going on? Why the lack of motivation? Whilst the rest of list are all contributory factors it is our values (ie what is important to us) that determine what we are and are not motivated to do. For example a value of safety may restrict actions that might, to your unconscious anyway, undermine that security. So goals for adventurous holidays, or setting yourself up in business, or moving house may go unactioned until the value of security has been met or it's impact reduced. More on values on Friday & Saturday. Being overly negative certainly isn't going to help us achieve our goals. See 'my prescription for positivity' blog with links to other blogs - including one on keeping away from miserable mackerels. A common reason at work and one that requires conversations with others to assist in prioritising our goals and day to day to-do's. Remember just because people keep giving you more to do doesn't mean you can't say "no" or "enough". So easy for adrenaline to be on "go go go" and for us not to notice we can't stop and take time to reflect, regroup and redirect our efforts. See my 'we love the challenge but is it good for you' blog for more on this. If the thought of being away from your phone or emails for more than a few hours horrifies you then I'd suggest you might fit in this camp. My 'don't go cold turkey this Christmas' blog looked at all those 'smaller' addictions we might have that are negatively impacting our lives. Also see well being below. Beliefs are such a huge area I'm going to dedicate next weeks blogs to exploring beliefs and the impact they can have. For now just notice what beliefs you have about your ability to achieve the goal, or the worthwhileness of achieving it or even whether you think you deserve the outcome. All factors that can seriously get in the way of us taking the necessary action to achieve our goals. Fear is so closely linked to beliefs I'm going to cover it next week. If you think fear might be what's stopping you just notice what beliefs you have that are linked to the fear. Water/ food/ exercise/ sleep/ connection/ meaning are all aspects to well being that often get forgotten and yet are hugely important on a daily basis for finding the energy, concentration and motivation we need. If you need further evidence of their impact Arianna Huffington's book Thrive covers much on this topic. The solutions whilst obvious are so often over looked. It's not always age or just how things are that are contributing to a depressed energy and lethargy. I can't tell you how much more motivated I became once I realised my hormones needed a little support (herbal for me not HRT). I hadn't realised how my desk chair was putting me off sitting at my desk at home until I bought a new one. (Don't also forget the ergonomics of your desk either - desk/ chair/ mouse/ footrest/ screen/ heating/ light are all factors). Clutter and unhelpful visuals can also have a huge impact. After all the unconscious is never asleep and is always picking up things from all around you - ie is it seeing things that metaphorically say "don't bother" or "lets do this". Why not take a few moments to look around your normal work environment - what might your unconscious be picking up? What words do you notice and are they supportive or not? What about visuals (removing that dead plant from your desk might just make a difference)? Is it cluttered or tidy (for some seeing clutter just won't help them tidy their mind to keep to one task at a time). You get the picture. Smell can also be very helpful or otherwise - I use a oil burner in my office at home and use uplifting oils (rosemary or bergamot are good for getting things done). It's often useful to have a cheerleader to support you in your goals - it's no use spending time with the "no wayers". You need to find some "horrayers" :-). Action isn't necessarily going to come if you've had to convince yourself you do want the goal because you think you ought, should or must do it or if someone told you to. Goals aren't going to happen unless you really want them to - especially if it requires lots of time and energy. As I mentioned yesterday the positive things you're getting from not moving towards the goal do need to be addressed ie what is staying where you are giving you that you would lose if you achieved your goal. We're looking to find the positive by products of staying as you are. Once you've identified what these by products are you can decide whether they're worth keeping or ditching. Hopefully one of the suggestions above might have triggered something for you about why the goal has yet to be achieved. Therefore enabling you to take the necessary action so that the goal is realised. I would love any further suggestions on what can stop us achieving our goals. What's stopped you in the past and what did you to do to release its hold. For the next couple of days I'm exploring the impact values has on achieving our goals. If goals are not sweeping generalisations as I discussed yesterday - what are they? Goals are objectives and there's plenty written that suggests that goals should be expressed as SMART - ie specific, measurable, achievable, realistic & time bound. The problems with SMART objectives is they aren't necessarily smart! The acronym misses out some of the very components that are essential to achieving our goals. That is its very common to set a goal that is dependent on someone else, or impacts others in our lives or expects us to give up something that's important to us. The challenge of course is to ensure this doesn't stop us achieving what we want - as they certainly can. 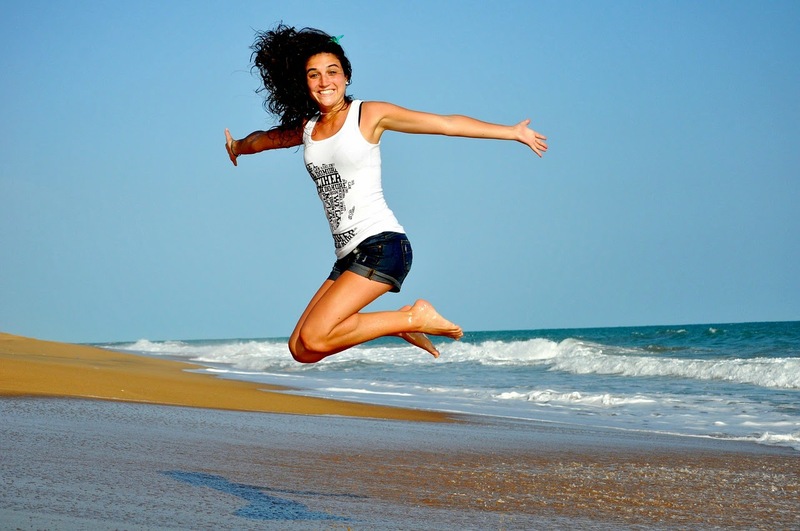 The following 9 step NLP process will ensure that your desired outcomes are well formed. By doing this you maximise the likelihood of the outcome being achieved – assuming you take all the necessary actions of course. Consider what do you want and what the benefits are to you of achieving this outcome? That is why is it important for you to achieve this goal. What pleasure will it afford you or pain will it move you away from? You're not going to take the necessary action unless it gives you something and this question is about finding out what that something is. For more on finding out about the values that motivate you or otherwise see this blog. How will you know when you've got it? Describe, as if it's happening now, what its like to have achieved this outcome. Use all your senses to describe it: sight, hearing, feelings, taste & smell. Really go to town on describing the outcome. Perhaps even write a letter to someone telling them what it's like? Or write your diary entry for that day? Or imagine the conversation with your best friend? Do what ever works for you to bring the dream into life. Other ways of bringing this alive include drawing a picture, collages, writing a story, making an album of tracks and so on. I find Pinterest is such a great way of doing this. Can you start and maintain it? Ensure that the outcome is something that YOU can make happen. If it's conditional on other people then consider in what way you can redefine your outcome to something YOU can achieve. Someone once wanted his son's reading age to be x by y months time. He had however no control over whether that was possible or not. The outcome therefore then became about him saying he'd do something every day to support his son in improving his reading skills. How does your outcome need to dovetail with others in your life? Imagine how this outcome may need to be amended to ensure it includes the needs of your friends and family. This won't always be appropriate but often it is the omission of this that stops us moving towards our dreams, because we're leaving the important people in our lives behind rather than bring them with us. An odd example but when setting an objective for moving house I'd forgotten to include my cat! I was busy imaging living in the middle of nowhere and my unconscious knew that meant an unhappy cat as I travelled with work leaving her alone for days. So the goal needed to include there being people close by (so perhaps not so much in the middle of nowhere) able to look after the cat when I wasn't at home. As she's always had a cat/house sitter since moving here I think that worked. In what context do you want it? When, where and with whom do you want it. Sometimes the answer to this is now, everywhere and with everyone. Other times it won't be - as with all these questions sometimes they wont apply and sometime they'll really make the difference. Sometimes it's about something else needing to happen first - kids leave home, other family commitments change, you get a specific qualification and so on. At least it takes the pressure off for now, and helps you set other goals along the way to support you when the time is right. What are the benefits of staying as you are? I can't emphasise enough the relevance of this question. This is often the reason why someone hasn't taken the necessary actions to achieve an outcome. What do you think you'll lose (that you value) as a result of moving away from where you are now? And more importantly how can this be incorporated into your outcome? Again a more personal example: When setting an objective for being in a relationship I was basing the outcome on previous relationships. Having been single for a while I'd come to appreciate 'me time' and the unconscious believed a relationship and 'me time' were incompatible which means I wouldn't take the actions needed to achieve the goal. As soon as I stated I wanted a relationship that still allowed 'me time' then my unconscious enabled this to be an outcome I really wanted and therefore take the necessary actions to achieve it. What emotional, physical, financial, time, information, support and other resources do you need to make the outcome a reality? And what do you need to do to have them available to use to achieve this outcome? A great one for work - and reminds me of Amanda Palmer's the art of asking ie we may need to ask for more resources to be able to achieve this goal. What are the positive consequences on you, your family, others, society and the environment of you achieving this outcome? The bigger, brighter and more worthwhile you can make it the better. I think this is the aspect that is most stopping me finishing my book. After all I can have met all the other criteria but who cares if only one other person reads the book? Not something I worry about when writing blogs but then why write the book if I can happily keep writing blogs. I think I need to really understand why the book is worthwhile. What is your first step. What will you do first and when will you do it? Bizarrely as I write this blog at the weekend, for publishing on Tuesday, I've already ear marked Wednesday to writing another chapter of my book! So my first step - before Wednesday is to have explored more why the book being published is worthwhile and the wider implications of its publication. If you've got a goal and you're not taking action to achieve it you might just want to double check which of the above 9 steps are missing? More on what else might stop us achieving our goals tomorrow and the contribution values can play the day after. Would love to know how you got on. I love how the theme for the blogs emerge each week. Last week stakeholder engagement was inspired by news of yet more organisations trampling all over suppliers with their payment terms and seemingly ignoring procurement's best advice. Stakeholder influencing and trust last year was sparked by a question on Twitter. This week's emerging theme is goal setting - or more effectively achieving our goals. As ever I'm not sure where it will end up by the end of the week but I'm starting with the words of Jillian Michaels that I scribbled down in the dark from a recent show I attended in Glasgow. "Health is a sweeping generalisation"
You know me I love words - and of course she's right - health is a generalisation and nominalisation and therefore it means different things to different people and certainly isn't something tangible you can see or touch like an apple. Which means if I say "I want to eat an apple a day" we all generally understand what I'm aiming to do. 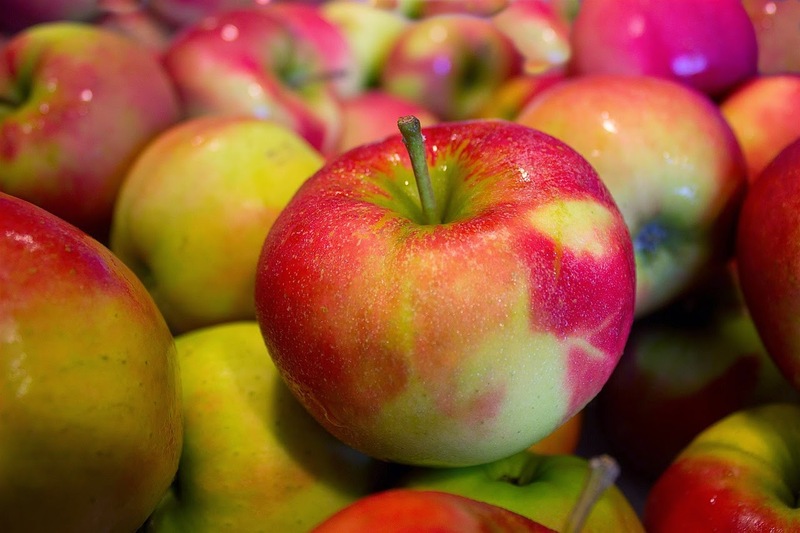 We might have different perceptions about the type of apple but we'd be in the the right ball park. These aren't all mutually exclusive, and some are end goals and others are means goals ie it's likely we'd be wanting to eat healthily in order to achieve some other goal rather than it being an end in its own right (although I concede not necessarily). "Where's the road map to nowhere?" Just like we can't have health as a goal without knowing more about what that looks, sounds and feels like to us personally, we can't have any goals that involve any nominalisation or generalisation. So love, balance, health, relationship, communication, freedom, wealth, adventure etc all fit into that bracket. If you have any goals - personally or professionally - then you need to understand your destination and then you need to decide on the route you're going to use to get there. (love that we can get the landscape metaphor* in to goal setting). Blogs this week will explore how to move goals from generalisations to verbs and outcomes achieved. * Landscaping Your Life is a process I use with clients which uses nature as our teacher. A number of the other tools I use in coaching and facilitation all got a mention last week - In business there's the Frameworks for Change coaching process and the Creative Whack Pack. In personal coaching sessions there's collage cards and the Transformation Game. All great tools for assisting us in releasing what's holding us back from achieving our goals. Or should that be all great at inspiring change inside and out - when what we're doing isn't working. I've saved the 2 tools I use in a personal setting until last - yesterday I shared more about using collage cards. 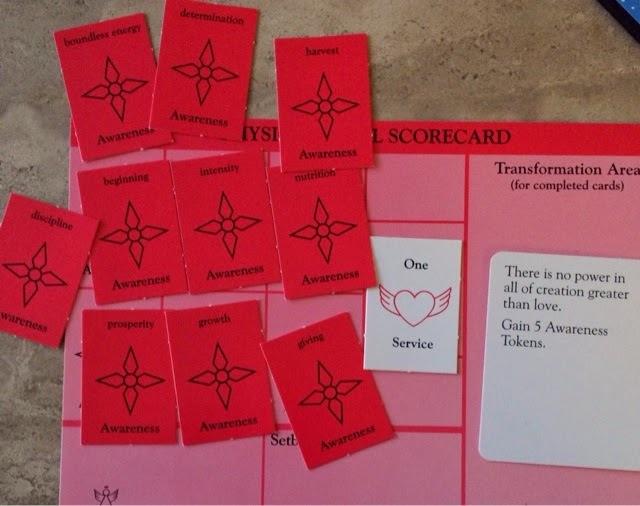 Today I'd like to share with you more about the Transformation Game - a fantastic tool for personal and spiritual growth which can be played solo or with up to four people (with a facilitator or on your own if you buy the game (available from Amazon)). 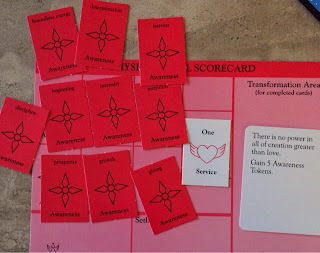 As the theme this week has been about improving business relationships I thought I'd continue the theme into a Transformation Game and just see what happens. In order to get more from reading this blog you might want to think about a relationship you'd like more insight on? What benefits would you obtain if the relationship was to improve? Would it be useful if you were able to understand what actions to take to release the current phase of the relationship? 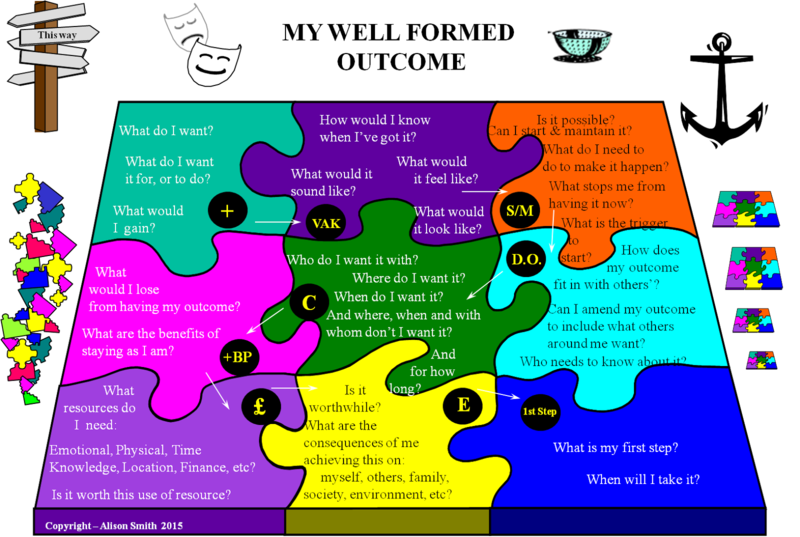 Suffice to say the Transformation Game is a board game, has a number of squares on each person's 'life' path, playing pieces and a die and to finish you have to work your way up through 4 levels (physical, emotional, mental and spiritual) and have no pain. Along the way your experience of landing on the squares provides insight to the problem being explored (or should that be - your unconscious helps you see the patterns in common between the game and the situation). There is much more to a game than words here can ever hope to convey so for ease of understanding I won't share much of the means of moving up levels just the insights and challenges from the different squares. And yes it can go deep - which is why it's used in a personal not business setting. The more accessible process for business is Frameworks for Change Coaching process the Transformation Game's cousin. Intention: I intend to improve my relationships with others in a business context. Our relationship with others can get very stale and full of difficulty if we're not very happy. 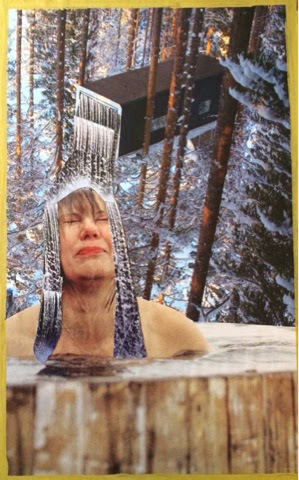 This card reminds me to do the things that inspire me - whether that's walking in nature, singing at the top of my voice to my 'happy' playlist or, as someone reminded me this week, making collage cards. When we're full of inspiration our ability to be with and relate to others improves considerably. So too our ability to see alternate ways of relating to others. 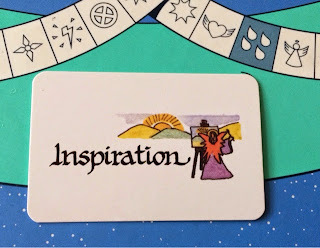 What inspires you the most and when did you last do it? I love this square - always a great reminder to be of service to others freely and unconditionally - just by sharing our awareness. How often in business do we hold back because we don't think it's our job, or they didn't ask or think we can only give if we get something back in return etc. A reminder for us to freely share our thoughts and insights with others. Insight square: there is no power in all of creation greater than love. It's so easy at work to leave everything that makes us human and uniquely us at the door. To put on the stereotype of being in business (or for me the alpha buyer stereotype working in procurement) and feel that the softer values and behaviours are not appropriate. Yes we have to make hard decisions at work but that doesn't mean we can't appreciate and show kindness and yes even love (compassion is perhaps a better word in a work context?) to others. After all we're all human beings with the same basic needs - why exclude them from our relationships at work. NB: As your read this summary of the game please note if any of the words resonate for you and more importantly identify what action you may wish to take as a result. After all nothing will change in a relationship unless you're prepared to make changes. Depression square - I am setback by failure - I get 4 pains that will slow me down until they've been cleared using 'appropriate' awareness tokens. Depression is a very restricting place to be - no energy, nor access to insights nor ability to make the right decisions. It can be very debilitating and will certainly negatively impact our relationships at work. The setback asks us to consider that the source of the depression is failure - actual perceived failure, or perhaps fear of failure, or even others attitudes to the decisions we've made. (In a game we'd spend some time understanding more about how we relate to this pattern of failure and how it sets us back. So if this is resonating do spend a little more time exploring this before reading further). Let's see what squares we land on next that will provide awarenesses to enable us to release this depression and the pain arising from the 'failure'. I am invited to appreciate another person and then myself. How easy to forget to do either. When did you last appreciate another and what about taking time to appreciate yourself? A great reminder that appreciation and gratitude are great means of shifting our mood, and in this instance releasing our depression. Dr David Hamilton has written much about the links between appreciation and wellbeing. The awareness cards that I pull as a result of landing on this square are Forgiveness and Absurdity. I wonder who needs to be forgiven in relation to the failure - me, the other person? And how does absurdity relate? Would others see the 'failure' as such, or am I just being absurd and overly critical and letting my inner critical voice depress my energy? Other awarenesses of laughter and authenticity are then also used to clear the pain. Certainly these are all words that remind me to just be me - if the other person doesn't like that then that's ok but it's no use being carnelian like to appease their preferences. I could go a few ways with this card. It could be about taking responsibility for improving the relationship rather than just expecting the other person to. Although I do also wonder if it might be about taking responsibility for our feelings and not blaming the other person. They are simply being true to themselves. Therefore staying around and just getting frustrated and continually being surprised by their behaviour isn't helpful. What would a role model of responsibility you know do in this situation? What a pair to add to the angel I already have. What would a mentor for each do in the situation? 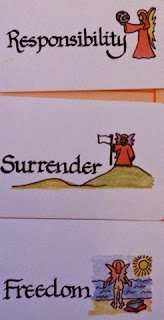 So easy to see surrender as negative rather than positive which is why it's easier to think of someone who has positively demonstrated this behaviour. I love the pictures on the cards - a reminder perhaps of choosing which battles to stick around for. That is knowing when staying around to fight is a good idea or, when it's negatively impacting your health, realising that surrendering to what is and just walking away is a better idea. Pain free setbacks are more about releasing any lingering attachment we have to this setback. I can certainly relate to that - having procrastinated on a number of actions in late 2014, and having found a new lease of energy as we start 2015. Have you or are you able to release procrastination's hold? Personally a reminder that I thoroughly enjoyed the three weeks intensive training we delivered prior to Christmas. I was fortunate enough to deliver training on my two loves - procurement and soft skills. 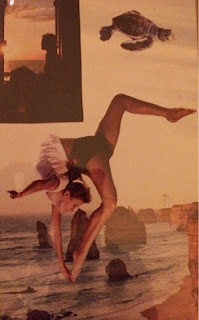 Certainly a time when my relationships with others were at their height as I was inspired by the work I was doing, and in turn that percolated out into all areas of my life. What is this card bringing to mind for you? How is education part of the solution to the current situation? Blessing square - as above sharing awareness with others, and it was certainly something I did a lot before Christmas. The line "I wrote a blog about that" being a common quote on the training having written a lot on influencing and trust in October. 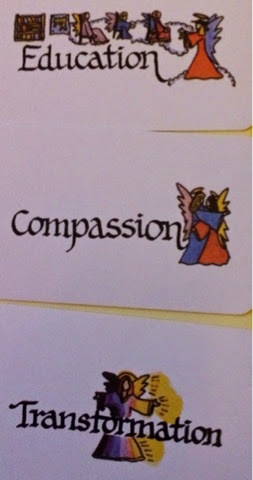 Wow compassion and transformation feels like a very powerful energy. Can't help but feel these bring together much of the learning thus far - being me, relaxation and letting the heart into what I do - even at work. Blessing square - yes another blessing square and a common pattern of mine - a continued reminder to share insights and awareness with others. Although having landed on a blessing square on the physical, mental and spiritual levels perhaps a reminder not to pull back from sharing spiritual awareness, as well as the more mental insights I often write about. What about you - do you pull back from sharing yourself in certain areas of your life? This pattern in the game might be inviting us to open up more in our relationships (after all if it wasn't a pattern that resonated I wouldn't notice it :-) - that's why our unconscious is so useful when playing a game - it's not the words themselves that are the key but our interpretation of them in relation to the intention). Transformation square - because I land on this square (the only one of this type on my life path), and I'm on the spiritual level, my game is complete. There's a lovely meditation that accompanies landing on the transformation square which talks of walking through a doorway which reminds me of the doorway described in the DVD and book choicepoint. 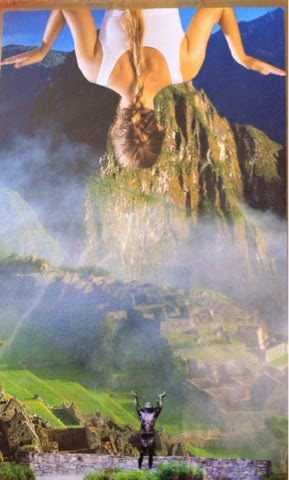 When I last landed on this square the image I had during the mediation was of me walking through the doorway onto a cliff edge, stepping off and flying - much like this collage card I made to represent it! Because of how we've pulled this card I think it's more like a pat on the back for releasing the energy of laziness, or a reminder to release any lingering laziness that's slowing life down. Pain free setback: looking for the worst in people? Expecting the worst situations? No wonder you live in a hostile and painful world. Over the years this card has come up a lot for me. I'm glad it's now appeared pain free as a sign, I hope, that I've learnt of the benefits of replacing pessimism with optimism. Is this a pattern you run and if so what would your relationships be like if you were able to move beyond it - to no longer be set back by its power. Reread the card again if you doubt it's negative impact. Isn't that what the rest of the game seems to have been about - loving our own uniqueness and taking that into all relationships in our lives. Would love to know if you've had any ah-ha's as you've read these notes which has really just been my interpretation of them. I hope you've got a sense of how powerful the Transformation Game can be. I also hope you've realised that if it was to be applied to a real life situation it would allow your unconscious to prompt you about what needed realsing, and the truths to be remembered. Not for the feint hearted but it never fails to amaze for those prepared for the discomfort as it takes you on a journey - one that has the potential for transformation if you're willing to jump off that cliff :-). 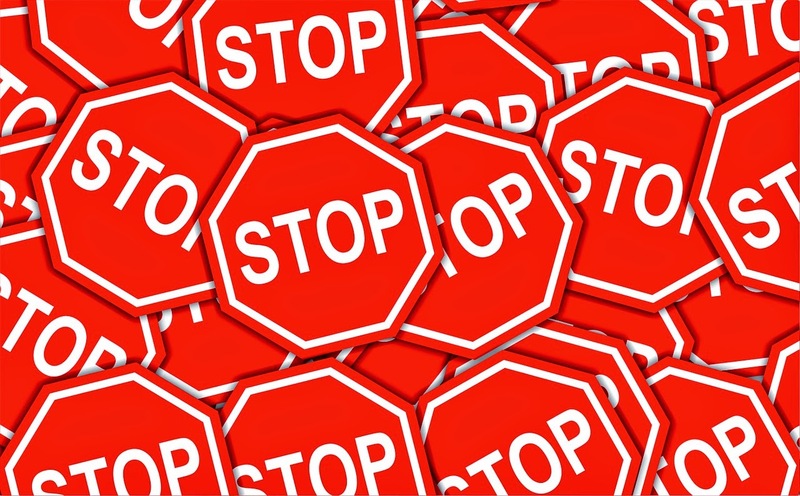 I also hope as the series of blogs has continued this week you've obtained insight into what you might want to stop, start or continue doing in order to improve the business and personal relationships in your life. Would love to hear your thoughts - either in comments below or directly at alison@thepurchasingcoach.co.uk or even call me +44 (0)7770 538159. 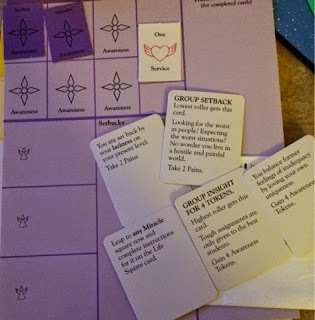 The process, the insight, setback and angel cards used here are from the Transformation Game ©Innerlinks - www.innerlinks.com. ANGEL ® CARDS (a registered trademark of InnerLinks, Asheville NC, USA) © 1981 Drake and Tyler; produced by Narada Media, 4650 N. Port Washington Rd, Milwaukee, WI 53212 USA. Use by permission. Another* tool I use in personal coaching sessions is collage cards. Taking this week's theme of developing relationships I thought I'd see what insights might be gleaned from pulling a few of my collage cards. unconscious makes meaning from the images (because it can't but help find meaning). When I made this card I assumed it was this way up - but have subsequently found it to be more useful the other way up. I wonder if its about 'giving' and 'receiving' in our relationships and inviting us to think about how much we do of each. Asking us to reflect how much of an imbalance there might be as shown in the different sizes of the 2 figures. I also notice mist between both figures potentially obscuring the actions of both. How might the motive of your actions not be as obvious to the other person? or perhaps be misinterpreted by them? You may get completely different insights from the cards than me and of course that's perfect. 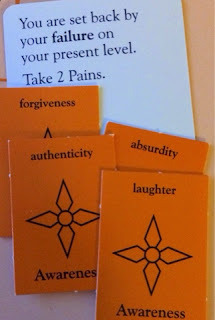 The aim of the cards is to help you tap into your inner wisdom not necessarily listen to mine :-). It's simply about helping you to see a situation differently, and therefore understand what actions you might be able to take in order to improve the current situation. Sometimes I wish I'd just be a little less honest and put a card back and pull a different one :-) . However I do need to demonstrate that, even if a card doesn't seem obvious at first glance, if we persevere, an insight can be found. I suppose I've always seen Dawn French as epitomising being happy in her own skin. Being truly authentic in all that she does and happy with it. In that context such a great reminder to hold true to ourselves when in relationship with others. I've generally seen this card as being one of purification. However in connection to the enquiry about relationships I wonder if it's about warning us about dumping our stuff onto others. A slower trickle might just be more effective than a huge bucket :-). Using collages is not a process everyone feels comfortable with but can provide some very meaningful insights. 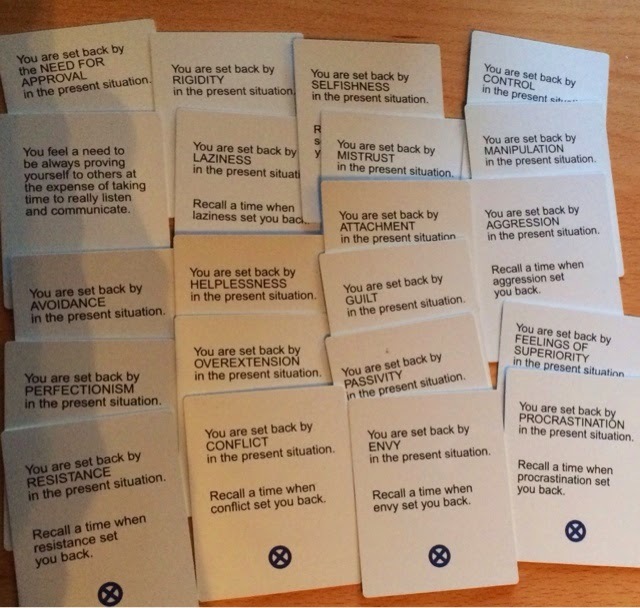 What insight did you obtain from these cards and as a reault what action will you take? 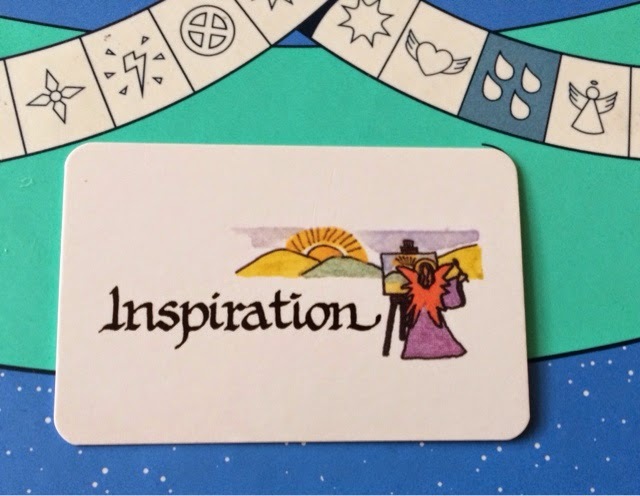 * Earlier blogs this week shared more about tools I use in a business setting such as Frameworks for change coaching process, creative whack pack and oblique strategies. Tomorrow I will share more about the Transformation Game - another personal development tool. More on how I use the collage process can be found here, and more about the origins of the collage process can be found here. Do they know what the potential pitfalls are? "I don't do soft fluffy stuff"
Is there room for kindness in procurement?